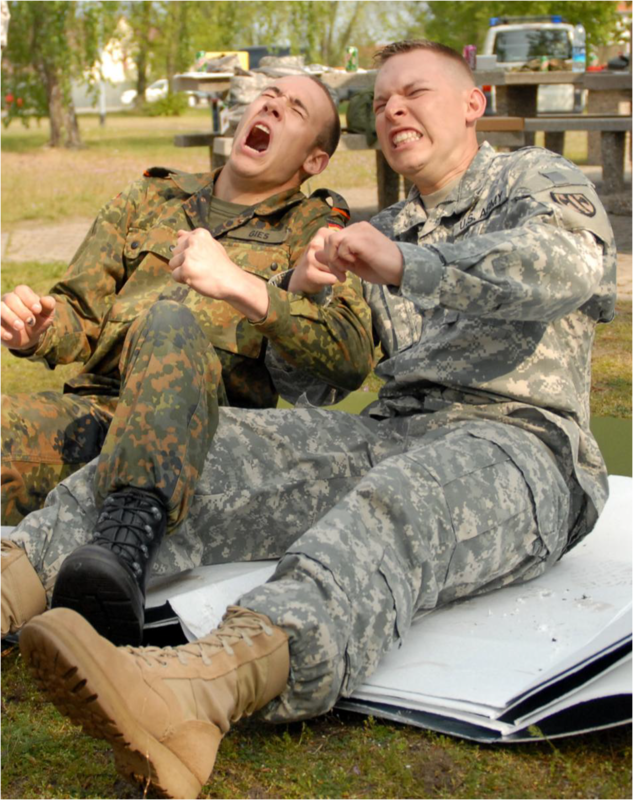 Take a look at these Soldiers going through Taser training. They may have more confidence and greater compassion to use a Taser as necessary, but “Wow! !” Couldn’t they just take that class online?! Unfortunately, no. We can maintain a level of physical fitness without much pain, but our spirits can’t really learn or change without pushing through it. Let’s consider some lessons from muscular pain first. Then we’ll look at God’s purposes for relational pain in Christ. Obviously, not all types of pain lead to spiritual growth. For example, we know that the burn we get during a good workout doesn’t necessarily produce lasting results and that sharp pain is usually a bad sign. But that dull ache we get in our muscles after we’ve pushed and kept pushing beyond our comfort zones – that’s different! Most fitness enthusiasts actually look forward to that sensation as “growing pains‟. The hurt can be so intense that we can hardly move 24-72 hours later, but after we’ve healed and go back (if we go back) we can bear the same load and with much less muscular pain. Scientists used to say that type of pain was due to a build-up of lactic acid, but now we know that our bodies remove that acid in about an hour. The new theory is that micro-lacerations (tiny tears) in our connective tissue are the source, but they’re not really sure. And the purpose of pain perplexes scientists even more: they agree that pain warns us, but they also agree that we can benefit by pushing through it. They’re confused because these two observations conflict with the theory of evolution, which is embraced by most scientists. Evolution would have us believe that we evolved because our body’s design helped us advance to this point. But our body’s natural designed response to pain is to stop in our tracks or even move backwards! Pain might warn us not to play with fire again, but it doesn’t inspire our bodies to push through it – especially if we know it will still hurt to do so! Genesis 3:16-19 seems to say that God gave pain to mark the felt threshold or boundary of physical comfort in this world. In other words, if our goal is physical peace in this world, we only have to do whatever it takes to avoid pain. But if we are pursuing God, pain is THE good sign that we are leaving our comfort zones of physical pleasure, strength, and safety in this world and, therefore, are to keep pushing. Remember, Adam and Eve were tempted to eat the fruit of the tree of the knowledge of good and evil by their desire to please their flesh: the fruit looked good and tasted good. The lure was so powerful that they opted to decide what is “good” or “evil” on their own, even at the expense of eternal life with God. So God gave us the sign of growing pains: again, if we want this world all we have to do is go with the flow, but if we want His kingdom we must push past our comfort zones here. Notice that Genesis 3 records God’s discipline in the same three areas in which He calls us to serve. To “be fruitful and multiply”, women must now push through pain (v 16a). To “subdue the world”, husbands and wives must push through the painful process of leadership (v 16b). And to “dress” עבד and “keep” שׁמר the Garden (verbs appearing together only 14 times in the Old Testament, connoting a priestly process of preparing and guarding something for worship), our “fruit” must come by our blood, sweat and tears (v 17-19). So, is God some kind of Sadist who can only feel better by making you and me feel worse? You gym rats out there – are you “sickos” for making your workout partner push through their pain? Of course not! You know that clinging to physical comforts actually works against all of us. Have you noticed that the most physically successful countries in the world eventually become the least healthy? They please themselves to death! But God cares too much to let us be at ease here. Consider the following thoughts on growing through pain. •Pain warns us, “If you do that again, it’s going to hurt again!” Heed these warnings and prepare accordingly! Spiritual pain, for example, warns us to read His Word, pray, live our faith, and ask for help. •If we rarely experience pain, we’re probably working in the limits of our strength and safety, loving our comfort instead. •Pain usually comes where the “parts of the Body” connect. Ephesians 4:16 says to care for the connections in His Body. •Pain can be lessened by increasing blood-flow to the muscle (stretches, massage, hot bath, sauna etc.). If your knowledge of His blood comforts you, remind other believers, too! •Pushing through pain builds endurance. Genesis 3:15 says Satan will “bruise” Jesus and His people, so we must endure! This entry was posted in Workout Wednesdays and tagged devotional, pain, W.A.I.T. training devotional. Bookmark the permalink.